We all love to save money where we can but are there some money saving ideas you would draw the line at? Here are a few ones I have come across which you might not have tried yet? Would you be happy doing any of them? I’ve used the same tea bags for more than one cuppa a few times. I have to confess that it actually worked out pretty well. The cheapest tea bags might not give you enough flavour for two cups, with the second one probably more closely resembling a cup of dishwater. However, better quality tea bags should definitely give you a couple of cups worth of flavour. I have found that fruit flavoured teas are especially good at giving you enough flavour to use again. Sadly, using the coffee dregs at the bottom of the coffee pot doesn’t turn out too well. I use one of those little pots you put on the cooker, with water in the bottom section and coffee above it. I tried to use the leftover coffee a second time one, with fresh water, but it turned out to be a pretty horrible experience. Some people seem to think that not flushing the toilet for a few days is a good idea. Sure, it will save you using some water but won’t the place start to stink a little? A far better idea is to put a brick in the water tank so that it doesn’t fill up entirely. Most of the time we don’t need to use all of that water and by using this money saving tip you will spend less on H2O and help save the planet at the same time. Heck, since we’re in the smallest room in the house we might as well stay there. This frankly baffling idea involves buying 2 ply toilet paper and then separating each sheet out into two extremely thin sheets. This sounds like quite an unpleasant money saving idea and I don’t really think that the cash saving could possibly be all that much. If you have kids then eating out in fast food restaurants is probably something you can’t avoid. This can be an expensive meal and the food isn’t usually all that great in these places, in my opinion. It seems that some people decide to make up for the cost of the food by taking home a bunch of those little sachets of ketchup, mayonnaise and salt. To be honest, this tactic seems to straddle that extremely thin line between saving money and downright stealing. Now taking home little bottles of shampoo from the hotel; that’s a completely different matter in my book. 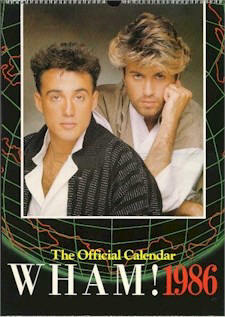 Have you got a 1986 Wham or Bros calendar hidden away somewhere at home? If you have then I have some good news for you. As long as you don’t mind looking at Andrew Ridgeley or the Goss brothers wearing old fashioned clothes for the next year then you don’t need to buy a calendar in 2014. The days fall in exactly the same way in certain years. This means that in 2014 you can use calendars from 2003, 1997, 1986, 1975 and a few other years further back. Even better news is that your heroes from the past can come in useful again in the future, starting in 2025 and then 2013, 2042 and 2053. Have you ever tried any of these strange money saving methods? Would you recommend them or would you draw the line at saving cash in these ways? Published by Danilo Promotions Ltd.
22 Responses to Which Money Saving Ideas Would You Draw the Line At? For me the taste is too strong if the bag is left for more than a minute or 2. So I can usually reuse it and still get a nice flavor. No thanks to any of them!!! Does separating toilet paper actually work? I mean, the less absorbent it is, the more you have to use, right? That trick seems a little silly to me. I sometimes re-use tea bags. I don’t think it’s that strange to do so. I’ve never heard of re-using an old calendar. I’ve always been able to get calendars for free from certain companies or organizations. I don’t think I’ve ever paid money for a calendar. I think I would draw the line at the rest of them especially the toilet paper option! I use tea bags three or four times before tossing them. They’re definitely good for more than one cup of tea. Separating toilet paper? THAT’S where I draw the line. It’s thin enough as it is! I’ve never tried using a tea bag 4 times Stefanie but will give it a try now. When I was younger, my grandmother would always tell us not to flush the toilet unless we went #2. Seriously, the water bill isn’t that expensive. Flush when you’re done. LOL. I use a small drop of bleach in a spare 2 liter empty bleach container. Dilute it with water. Use the mix substance in a spray container to spray in the toilet water to reduce the smell of urine: – for number 1. Flush toilet obviously: – for number 2. Being doing this for ages to try and support my budget. I have not tried spilting the toilet paper in two. But I have spilt paper towels in two for a alternative to toilet paper. The calander saver is a amazing option via budgeting. I have loads of back dated calenders at home. Must try this new experience. If you don’t laugh, you’ll cry instead..
Not Flushing the Toilet will be the one I draw the line. Eww.